U.S. Figure Skating’s DREAM program was developed with the goal of using the skating and leadership skills of America’s top synchronized skaters to influence the lives of developing athletes. Each year skaters are selected from a highly accomplished pool of applicants from Team USA synchronized skating teams to join U.S. Figure Skating in various programs to support and promote synchronized skating in the United States. In an effort to help promote Synchronized Skating, members of the DREAM program contribute to both a blog and a Facebook page. For more information on the DREAM program and to see the 2011-12 members, click here. To view the most recent blog posting, Happy Holidays from California Gold, click here. On Monday, Dec. 19th, Colorado Springs Mayor Steve Bach, U.S. Figure Skating Senior Director, Events, Bob Dunlop, 2010 Olympian Rachael Flatt and a gathering of fans and media met at the corner of Pikes Peak Avenue and Tejon Street to officially dedicate a 45-foot vinyl wrap of Flatt to promote the ISU Four Continents Championships to be held in Colorado Springs, Colo. from Feb, 7-12, 2012. Click here for more information and f0r all-event and single-session tickets which begin at just $9. Yesterday, Michelle Kwan was named as the lone member of the U.S. Figure Skating Hall of Fame Class of 2012. In case you missed anything that happened yesterday, this blog post will serve as a destination to get you all caught up. Michelle Kwan will be inducted into the Hall of Fame during an event on Friday, January 27th. The event will run from 10 p.m. to midnight and will include the induction and a reception. Tickets to the event may be purchased by clicking here. Kwan will be honored in an on-ice recognition as the newest member of the U.S. Figure Skating Hall of Fame on Saturday, January 28th during the senior Ladies free skate competition. Michelle Kwan has won SKATING magazine’s Readers’ Choice Award a record seven times. In honor of her amazing fans, it’s time for you to get your say! Send an email to socialmedia@usfigureskating.org with your favorite Kwan memory, a picture of you and Michelle or what she has meant to you. We’ll pick the top five to be put up for a vote to win a signed 5×7 of Michelle. The submissions will be all complied into a Kwan tribute as well on the SKATING magazine blog. Submissions will be accepted through the end of the day on Monday. Michelle Kwan, the most decorated figure skater in American history, has been elected to the U.S. Figure Skating Hall of Fame Class of 2012. To honor this occasion, SKATING magazine blog will be publishing each of the SKATING magazine covers Kwan has appeared on each hour for the next seven hours! Be sure to check back each hour and re-live the career of Michelle Kwan. Michelle graduated from the University of Denver in 2008 with a bachelor’s degree in international studies. In May of 2011, she graduated from the Fletcher School of Law and Diplomacy at Tufts University with a master’s degree in international relations. In 2006, Michelle was appointed the first public diplomacy envoy, a role she continues to fill under President Barack Obama. In 2001, Michelle received the prestigious James E. Sullivan Award, which is given to America’s best amateur athlete. Michelle received 57 perfect 6.0 marks in major competitions, the most of any skater in history. She was awarded at least one 6.0 at her last five U.S. Championships, a record that will endure as the 6.0 system is no longer used. At the 1998 U.S. Championships, Kwan earned a record 15 perfect 6.0 marks out of a possible 18. Michelle won a U.S. record nine World medals — 5 gold, 3 silver, 1 bronze. Her nine U.S. titles is a record she shares with Maribel Vinson Owen. After a pair of silver-medal performances at the U.S. Championships in 1994 and 1995, Michelle won the first of nine U.S. titles in San Jose, Calif., in 1996. 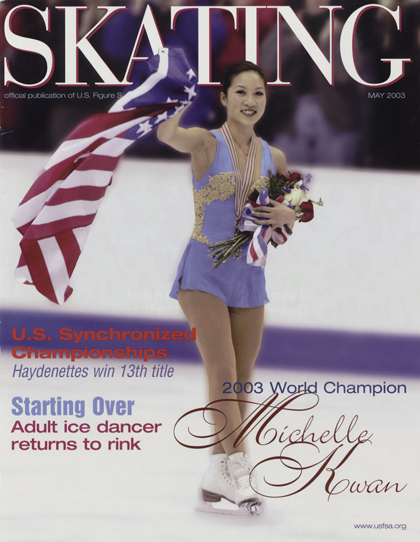 Michelle’s interest in figure skating began at the age of 5 when she followed her older siblings onto the ice. Ron was a hockey player and Karen was a figure skater. Team USA added a pair of medals today as Jason Brown and Joshua Farris both took home soft hardware. For complete event coverage, please visit icenetwork.com. The free dance is set for Sunday afternoon. Like the junior ladies podium, the junior ice dancing podium also belonged to Russia. Victoria Sinitsina & Ruslan Zhigansin led the way followed by Anna Yanovskaia & Sergei Mozgov and Alexandra Stepanova & Ivan Bukin. In their JGP Final debut Team USA’s Alexandra Aldridge & Daniel Eaton finished fourth. Note: Czisny tweaked her left lower leg practicing a triple flip. Though sore, the injury is not serious and was not further affected by skating on it.